Spooky Boo Halloween Ghost Stories! - Pebbles, Inc.
Spooky Boo Halloween Ghost Stories! Hello Pebbles Friends! 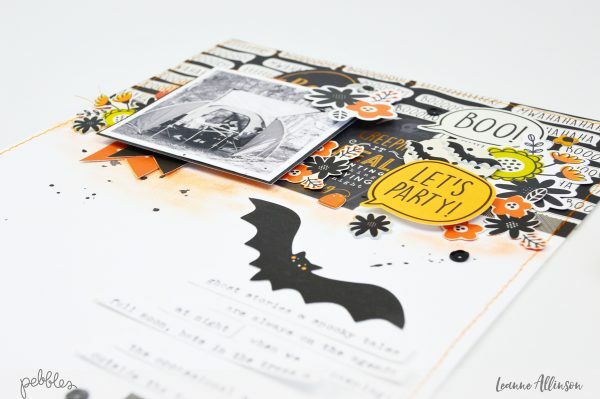 It’s Leanne here today, sharing a layout that will hopefully get you in the mood for a little Halloween mischief and mayhem! October is a great time of year to go camping for our family and one of the things the kids love to do, is to share ghost stories and spooky tales. 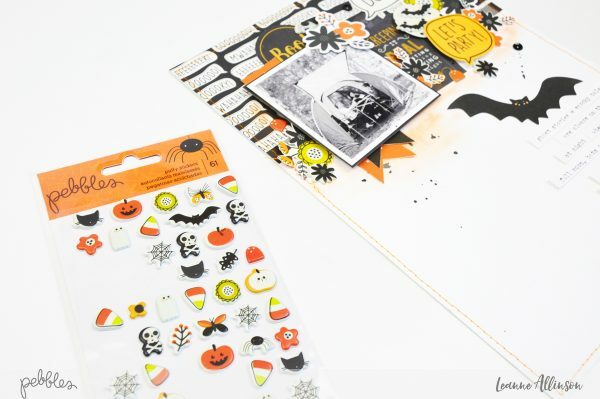 The new Pebbles Inc Spooky Boo collection is perfect for incorporating all things scary while still adding a touch of fun! 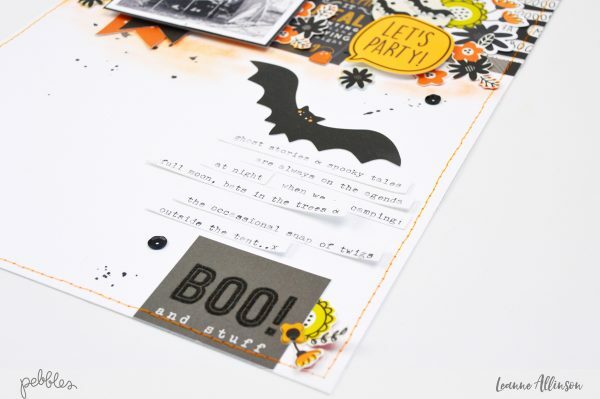 For this layout, documenting the telling of October ghost stories was fully supported with the Spooky Boo ephemera die-cuts. These stories were shared at any time a small gathering of avid listeners became available! Ghost stories would occur over the breakfast table, or at night especially around the camp fire. 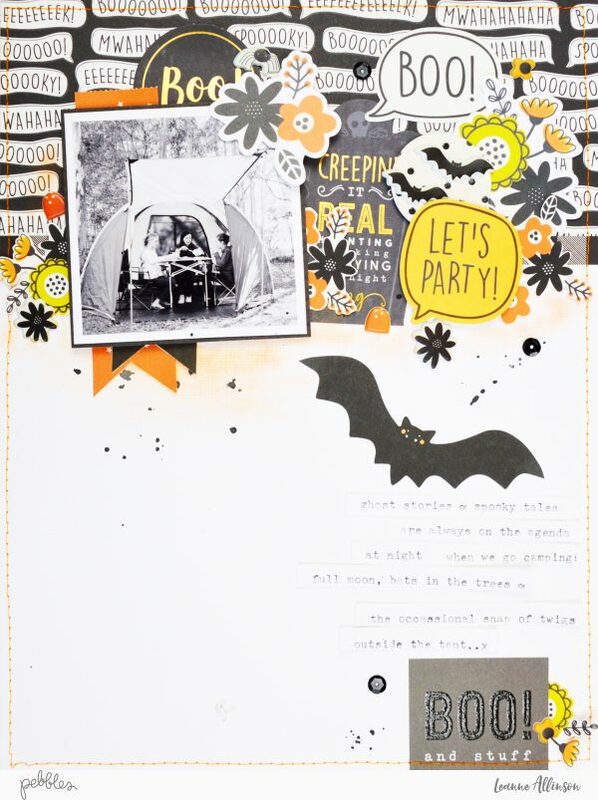 The main patterned paper I used on this layout is the speech bubble Spooky paper. Speech bubbles are a must if you’re going to document story telling at its best! When sharing ghost stories around the camp fire, someone is always doing a lot of talking!! Trim the patterned paper to cover the top third of the base cardstock. To ground it further to the white cardstock background, I have trimmed a 1cm wide strip of Meow paper. The reverse side of this patterned paper with the check plaid, softens the sharp edges, even though most of it is covered with other ephemera. Layers are always a fun part of adding extra detail to your layouts. Frame black and white photos with a dark patterned paper from the 6×6 mini paper pad and mount onto foam tape for dimension. Position the photo to overlap both the cardstock and the main patterned paper, which will then create a link between the two elements. Photo positioning will also help draw the eye across the page. 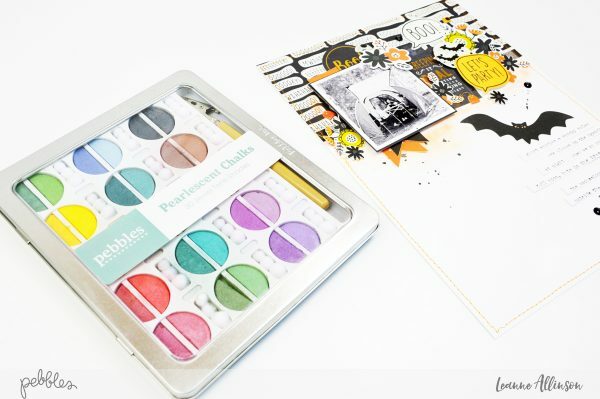 The embellishment clusters on each side of the photo help to focus on the layout’s ghost stories theme. The die-cut bat is slightly separate to the rest of the elements on the page. 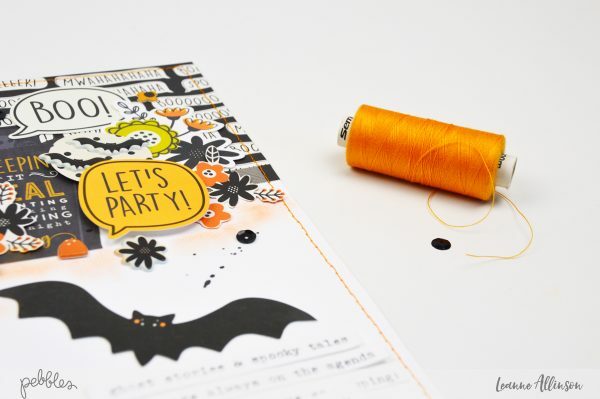 This allows the embellishment to pop against the white cardstock. 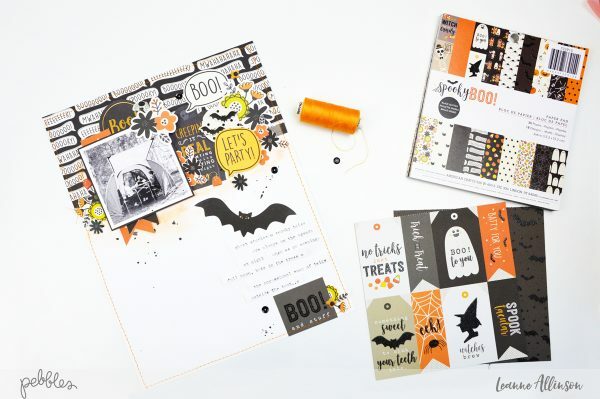 The machine stitching around the outside edge in a complimentary colour not only adds texture but tends to provide a space to contain all of the Spooky Boo scrapbooking elements. The typed journaling on the page has been cut into strip form and adhered to the layout with a small cluster of embellishments at the bottom. The journaling relates to the ghost stories and spooky tales tradition the kids have developed. Using puffy stickers is a great way to add bold pops of colour and dimension. I have also chosen to use similar themes from the stickers, rather than a mix of confusing elements. However, any of the puffy stickers would work on this layout. 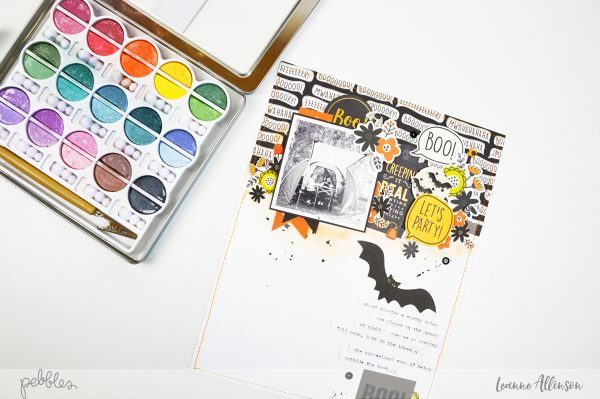 To complete the look of this page, apply a light covering of orange coloured pearlescent chalk, to the space below any embellishments that overlap patterned paper and cardstock. The extra blend of colour, combined with small paint splatters delicately ties the white space and embellishment clusters without confusing the viewer’s eye. Thanks for visiting the Pebbles Blog today. I hope that you have been inspired to play along and record some of your own ghost stories. Or even just the way these stories are shared. Happy Haunting!